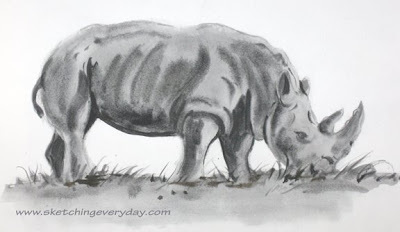 While looking for a drawing subject tonight, I came across a snapshot from my recent trip to Great Adventure of a White Rhinoceros. According to Wikipedia, "The White Rhinoceros or Square-lipped rhinoceros, is one of the five species of rhinoceros that still exist and is the most social of all rhino species. The White Rhino is the most common of all rhinos, with an estimated 17,480 wild-living animals at the end of 2007." See more animals from the wild safari park on my web log. 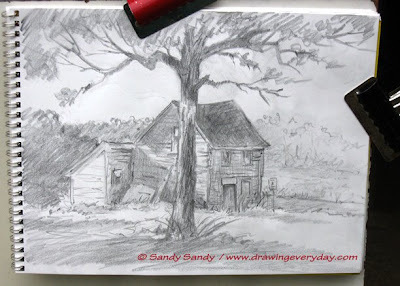 Here's my latest sketch of the old salt box house from this week's challenge photo. I almost said final, but you never know, I think this subject could possibly be done again at some point. Even though none of you sent in a drawing of this, I hope a few of you tried it, or at least, got something out of my efforts. 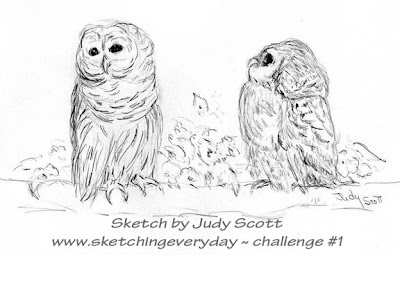 Here's an outline sketch of this week's challenge drawing. Among other things, this challenge involves making choices about design. I rarely, if ever, copy a photo exactly like it is. I use my photos as reference. They are not mindlessly copied from. Here's my revised composition of the June 22nd challenge photo. Look at my exploration drawing from June 25th also. How many things can you name that I have changed from the original photo? This is what is called "artistic license". You must know the basics about composition and design in order to make good choices however. I always cover this subject in my workshops, because it is an important key element to successful art. I'll post my finished drawing with our new challenge photo tomorrow. There's never a dull moment around here during hummingbird season. Watching them is better than anything on TV. I stopped at the local wild bird supply today to buy a couple of new feeders, but they were all out of the big Hummzinger. I think it is the best feeder on the market. I'm going to go to my Squidoo Lens and order a couple from Amazon right now. As you local people know, we've had a tremendous amount of rain the past month here. The woods are wet and there's a lot of mushrooms, moss and fungus growing everywhere. Yesterday morning I spent some time going out into our woods with my camera and my close up Macro lens. Here's today's sketch done from one of my photos. I've gotten some nice comments about my sketching blog and as always, I really appreciate the feedback. 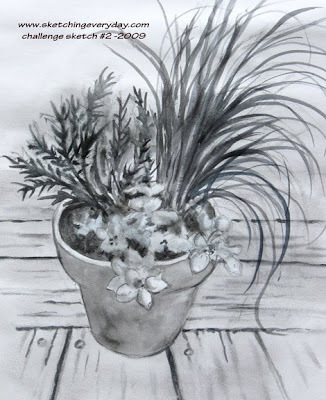 Joni Solis writes; "I love the soft feel of this quick sketch and you are brave to post them; many artists chicken out and never show their sketches." Hey, If anyone wants to send me a sketch and doesn't want it posted, just let me know. I'll try to give you a concise, constructive critique, if you want also. I decided to try this week's challenge photo today. I did something different and held my pencil like a wand to draw almost the entire thing. (95%, I'd say.) It was really enjoyable and seemed to free up my right brain. I used a 4B pencil and probably could have even gone softer. I moved and changed the tree and the sign and added a road. I don't like the tree in the middle of the page, so I will change that when I do my final design. 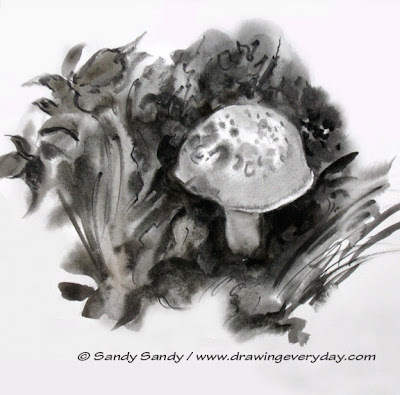 I call it an exploration drawing because holding my pencil like a wand freed up my mind to investigate, wander and play. Try it, you might like it too. 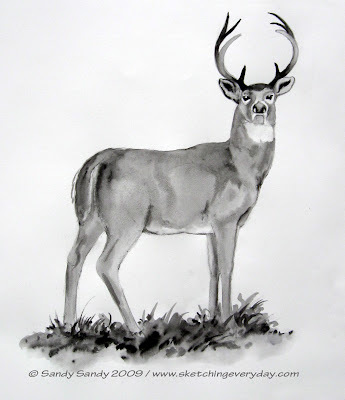 In watercolor, I often make up symbols for whatever it is I'm painting. I use the characteristic shape, color and texture. 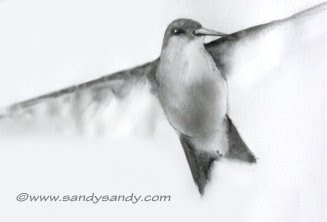 Tonight, I tried drawing some of the hummers at my busiest feeder, but they were just too fast for me. Only momentarily defeated, I went to my computer and searched the archive of hummingbird photos that I've taken over the years. I decided to challenge myself by doing some non-characteristic poses. This made me REALLY look at the SHAPES. Here is my favorite. I call it, "Big Spirit in a Little Package". 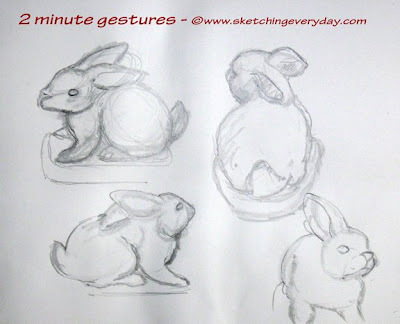 Here are four three-minute gesture sketches of another stone yard ornament I inherited from my Aunt Milly. I gave myself 3 minutes for each one instead of 2, so I could add a little more detail. At the end of each 3 minute session, I turned the cat 90 degrees. Remember, with sketching, nothing is set in stone! 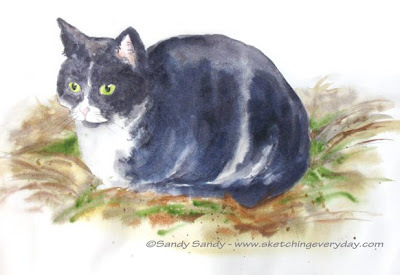 Here's my color sketch of our little black and white barn cat, Sophie. Thanks to all of you artists who have attempted my drawing challenges, even if you didn't send them in. 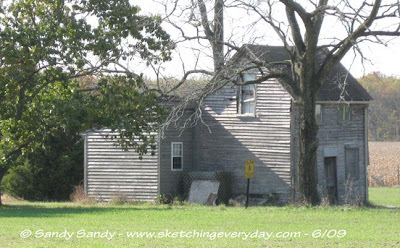 I'm also posting the forth challenge photo of an 18th century farmhouse around the corner from me. Remember, when you draw from photographs, use artistic license to create your own interpretation. This is a reference photo and it need not be slavishly copied. Although, if that is the way you choose to draw it, that's OK and your decision too. 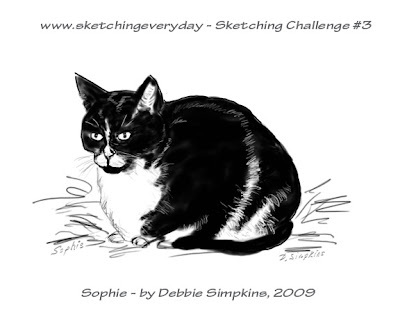 I did several quick sketches of Sophie tonight. I like this one the best. I call it a squiggle drawing. This proves how the silhouette is more important than what goes on inside the shape. It's so important to look at shapes when drawing! I did this drawing by making spiraling squiggles. It was fun, kinda like doodling. Give it a try when you are having trouble seeing shapes. This is done from the challenge photo from last week. I'm going to do another drawing of it tomorrow and will post the next challenge photo then. 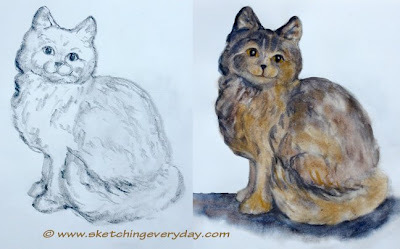 Today's post is a series of two minute gesture drawings of an old concrete garden ornament that I inherited from my Aunt Milly. I posted a "6 Step" drawing of it on June 2nd of last year. You can see that drawing here. I thought I had lost it. I've been looking all over for it for weeks, then just yesterday, Jerry found it! I walked outside and there it was on my back studio porch. I love sketching these three-dimensional objects, but I find it harder drawing something stylized than sketching something natural. I just keep telling myself; "Just look at the shapes!" 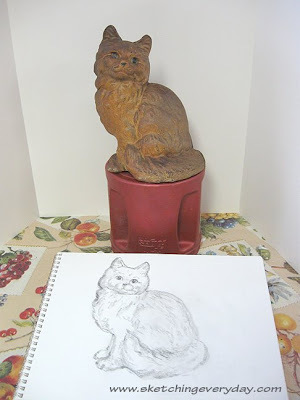 I thought I would try some color on our little cat doorstop drawing from yesterday. I'm not completely satisfied with it, but it is what it is; a sketch, a study, a stepping stone. I love this quote I put on my facebook page yesterday. "For an artist, any accomplishment is merely a minor victory over failure, and no more than a small step up the steep and tortuous path towards excellence." ~ Ian Semple . . . So lets all keep plugging along together guys! 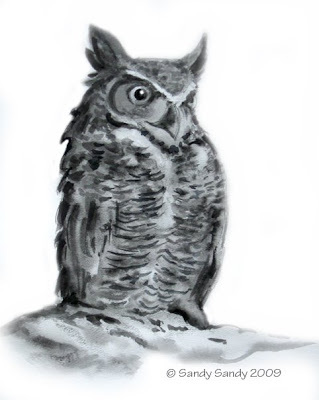 Today, here's another sketch from photos I took at the Cedar Run Wildlife Refuge. 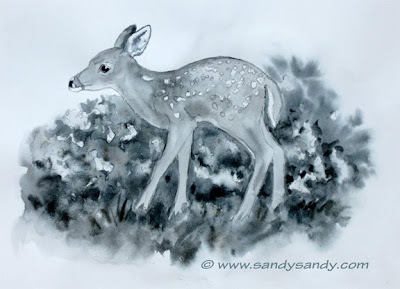 I also donated a small 5" x 7" oil painting of this little sweetie to the "Wine And Wildlife" event at the refuge last month. You can see the painting I did here. Here's Tuesday's Drawing. I sent it out to my Google Group last night right after I finished it, but I guess I forgot to post it here. 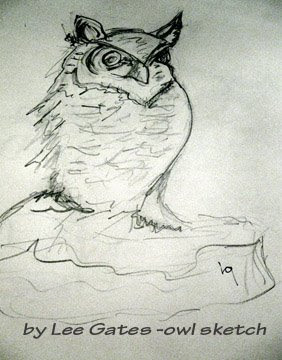 Tonight's sketch is from an oil painting that I donated last month to the Cedar Run Wildlife Refuge. I liked this pose, so I thought I'd try it as a sketch. It never hurts to redo something, because repetition is the key to mastery. You can see my little 5" x 7" oil painting here. 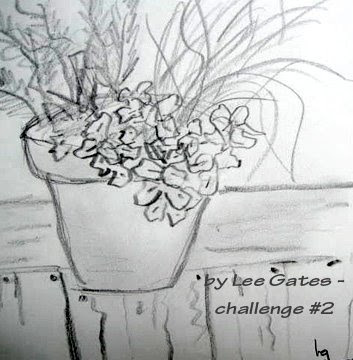 Here's the second challenge sketch of the little herb garden that I posted last week. It's not the best drawing I've ever done, but they can't all be winners. Like you, I have to remind myself that that it's just a sketch and the process is more important than the product! 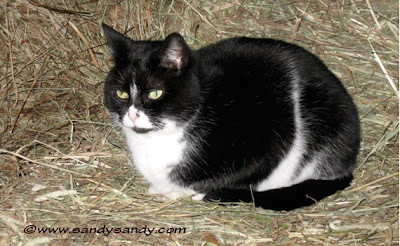 Here's this week's challenge photo of Sophie, our little black and white barn cat. I hope you like it and will give drawing her a try! I finally had a chance to do a sketch and I wanted to make it quick, so I could go and veg. out. 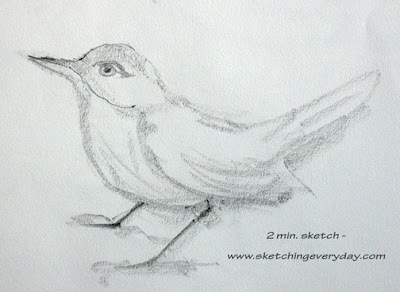 Here is a two minute sketch of another bird carving of a wren I own. 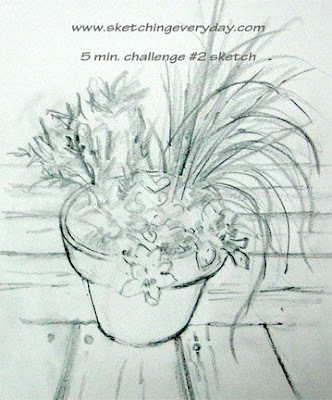 I'll post my new challenge photo and last week's challenge sketch manyana. Night-t-night ya-all! This time of year is so busy for us all. Today I am going to Six Flags Great Adventure for the day with my two sisters, two brother in-laws and neice and nephew ages 6 and 4. 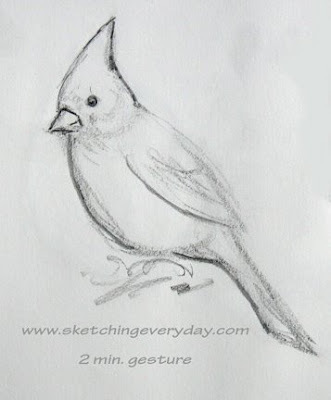 No time to do a complicated sketch this morning, so here is a two minute gesture of one of my bird sculptures. They are always nearby and available for a quick modeling session. 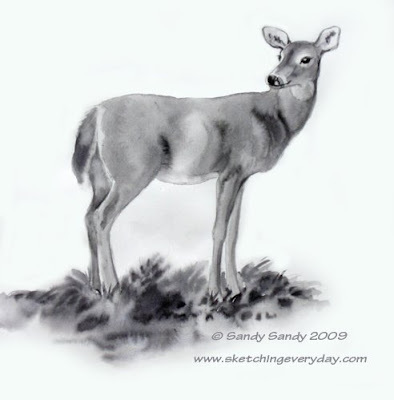 I've got lots of pictures to use as reference of my favorite doe, so today's sketch is a portrait of Fuzzy Tail. She's got a little fawn hidden in the woods somewhere around here that we haven't seen yet. 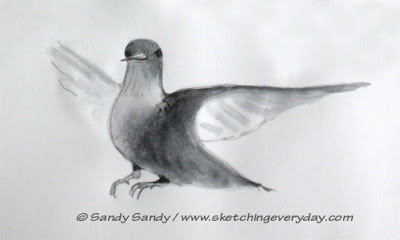 Today's sketch is of one of the local does that visits our yard on a daily basis. Her name is Fuzzy Tail. We have known her since she was a wee baby. Although we can't get too close to her, she is not afraid of us and feels safe here. 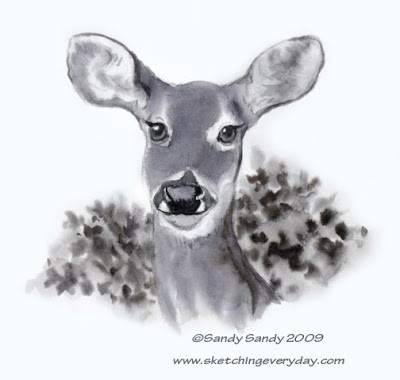 She can often be seen eating in the horse pasture or lounging around at the edge of the woods here at the Sandarosa. Today's sketch is of one of my favorite creatures, Handsome Stranger. I see him daily. He is a definitely a messenger from Spirit. Read the story here. OK, I see I am inspiring a few people now! Lee Gates sent in two drawings today. She was a little confused but that's OK. She copied my sketch from June 2nd as the first challenge and later sent in her sketch of the current one. THANKS Lee, Good Job! I showed Jerry the photo I chose for the 2nd sketching challenge last night and he said it looked hard. Tonight I did this rough sketch of it in about five minutes. It wasn't as easy as I had thought it would be. Maybe it was because hubby planted the seed in my head that it was hard or maybe it's because it's 10 pm. Anyway, it wasn't that hard! I'll work on this again this week and post my drawing on Sunday. I hope some of you out there in cyberspace will join me. Remember, it's not the end result that is important, it's the process! Drawing is an exercise in discipline, seeing, coordination and technique. 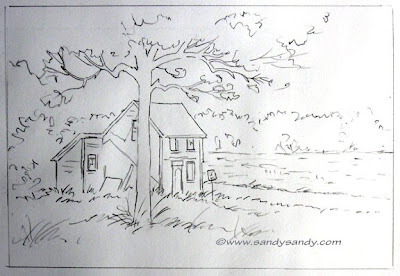 I was happy to get this sketch and a nice email in my inbox this morning from friend and Cedar Run employee, Judy Scott. She writes; "I took up your challenge. Because I have access to Squam I combined two pictures. 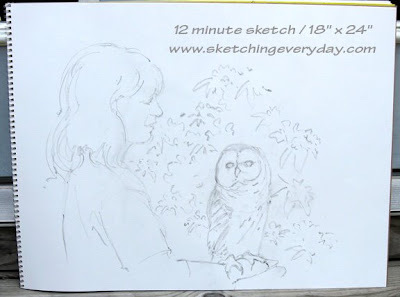 This is a sketch of Squam and a fledgling Barred Owl. 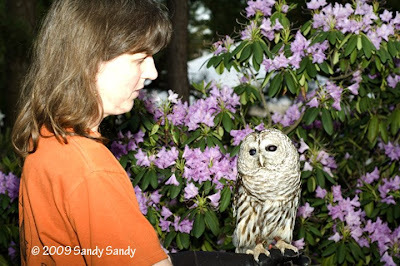 In 2007 Squam was a foster parent to a young Barred Owl that came into the refuge. 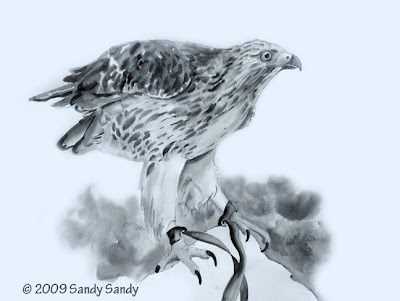 Although Squam is a male, he was a great surrogate, teaching the young one to eat and fly. Eventually the fledgling was released back into the wild. Thanks for all your support of Cedar Run." 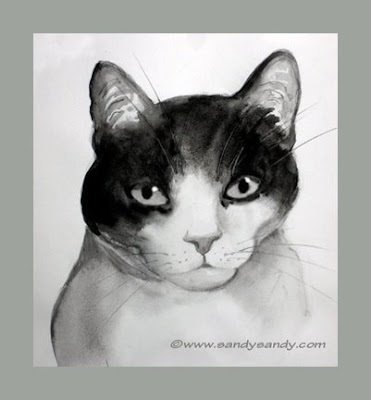 Wow, Thank you Judy for the lovely sketch and a little backgound on Squamie! I hope your effort will inspire others! Today I added the second step of my 6 Step System to yesterday's sketch. My motto is KISS - Keep it sensationally Simple!! Here's my interpretation of this week's challenge sketch from Cedar Run Refuge that I posted last week in my very first post on June 1st. So far nobody has sent in any drawings, although a few of you DID say you were going to try it. I hope you guys won't chicken out on me. This does not have to be time consuming or difficult! I did this sketch today in my big sketch pad. I was trying for 10 minutes, but it actually took me 12. You'll notice I didn't get past the first step of my drawing technique. The whole drawing was done holding my pencil like a wand and using my whole arm. I squinted a lot while I was drawing and tried to get down the overall big shapes as quickly as possible. I will still post any drawings you want to submit! Better late than never. I'm also posting the new photo for this week's challenge. This is a herb garden that my friend Dorrie brought to me yesterday, along with three beautiful patio tomato plants and fertilizer! 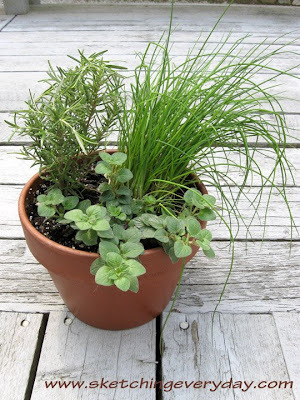 This little pot shown here has chives, oregano and rosemary in it. It has a wonderful variety of textures, directional thrusts and shapes. Thanks so much Dorrie. My friends are simply the best! This one is super easy!! You should be able to get the overall shape down on this in under a minute with no problem. 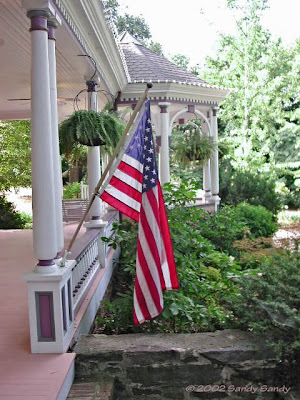 I am having guests arrive here this afternoon for a visit and dinner. I've got the roasts in the crock pots, but still have lots to do. That doesn't leave a lot of time for sketching, but you don't need a lot of time!! Today I did these gesture drawings in under 10 minutes. It is such a great drill and I don't do it enough. It's one of my favorite exercises at my workshops. See more of an explanation here . Learn Sandy's 6 Step Technique Here! It's been a trying couple of days with the phone and internet. I've had cable guys here yesterday and today. All the issues are not solved yet, but I hope we are getting closer to a solution. 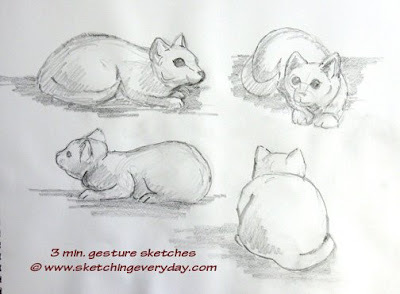 I was waiting for the technician to arrive and wondering what to draw for my sketching everyday post, when I got a call from someone who's adopting a cat from our local animal shelter. 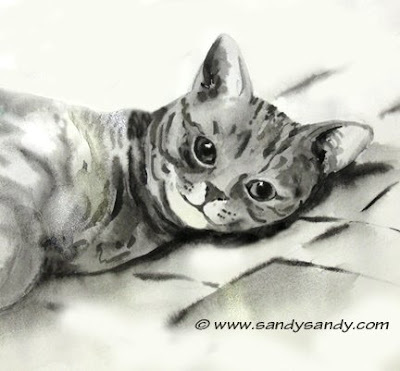 He got my name from Lisa, the shelter director, who told him I'd do a portrait of his new kitty for a $75. donation to the shelter. I went online and looked at his new girl and did this sketch of #26615 "Angelica" tonight. I plan on doing a little oil painting and take it over to the shelter early next week before Don goes to pick her up. So, that may be a good way to go about this, all you Art For Shelter Animals Artists. 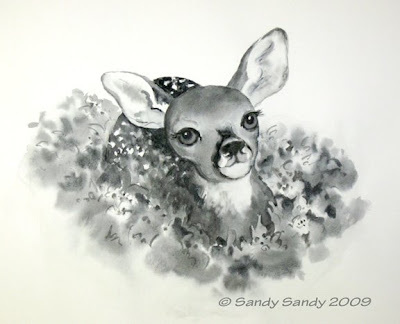 Have the shelter tell the new adoptees that you will do a painting of their new addition for a donation to the shelter. Hey, it works for me! 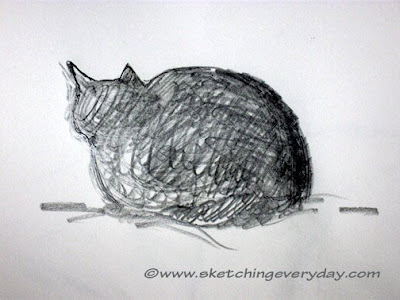 Tonight for my sketching everyday post, I decided to do a shelter animal sketch. Now that the Cedar Run Fund Raiser is over, I've been thinking a lot about the "Art For Shelter Animals" Project again. I went online to my local shelter's web site, and saw this little cutie # C-27468. She looks just like my Tiger cat, so I call her Little Tigress. She is a small, healthy, loving, declawed orange tabby who is about 3 years young. If you'd like more information about this kitty feel free to stop by the Burlington County Animal Shelter. If you call them please have the kitty's identification number handy. Remember, your local shelters and refuges are happy and grateful to accept donations of a variety of items. During the spring and summer there is increased need for kitten milk replacement and kitten food. Toys are welcome for the kittens and younger cats. Newspapers and soft bedding material, such as fleece and towels, help keep the residents comfortable. Call your local shelter or visit their web site to see what other items they might need. Today I did a Red Tail Hawk portrait from another photo I took this past weekend at Cedar Run Wildlife Refuge. 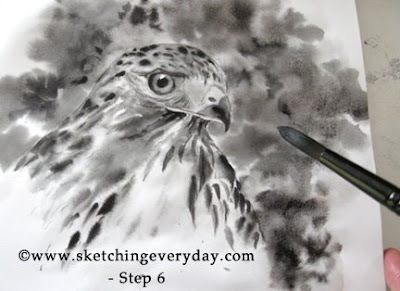 I documented the process and will post a new demo of my " 6 Steps To Sensational Sketches" online soon. Today's sketch is another one of Cedar Run's residents. These animals live out their life in captivity because they have either been injured or have been humanized so that they cannot fend for themselves in the wild. Humanization of wildlife, although well intended, is probably one of the most detrimental injuries. Wow, I can't believe another year has passed since I sketched Every Single Day! I've continued to sketch, mind you, but not as regularly as I have done during the past three summers. I'm really excited about embarking on my drawing everyday adventure once more this year. 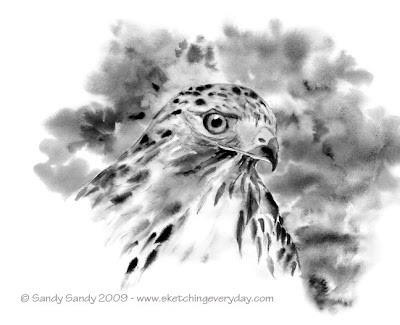 This is a sketch I did today of a Red Tail Hawk from a photo I took this past weekend at a fund raiser for the Cedar Run Wildlife Refuge. This year, I'm posting a photo at the beginning of the week. 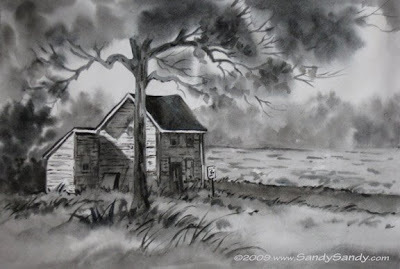 If anyone chooses to sketch it and send in your results to sandy@sandysandy.com, I'll post them here on the following Sunday with my interpretation. Here's a photo of Squamie, the Barred Owl at the Cedar Run Refuge. 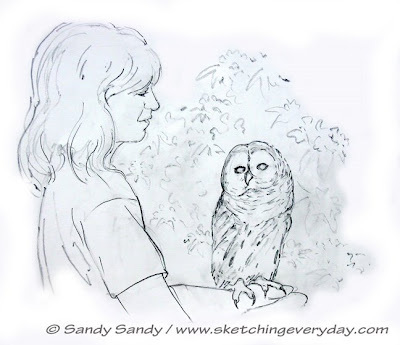 If you want to receive these daily posts and pictures via email, just contact me at: sandy@sandysandy.com with "Drawing Everyday Subscribe" in your email.